Welcome to the First Hose Company of Boonsboro Guestbook. Your feedback is important to us. Feel free to leave your comments. Guest Name: Anthony P. Esposito Jr. I was impressed with your website. Stay Safe! I could work for this F.D. Oley is a class act. Very nice site..well put together. Just wanted to wish you and yours the Best for the Season, Merry Christmas and a Great New Year...keep up the good work and be safe! 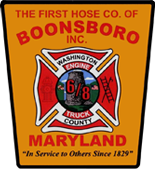 I would like to thank Ed Williams, Vern and the day driver at Station 6 for the hospitality and help with the station tours and apparatus photo session during our visit to Boonsboro on September 24, 2015. You guys are AWESOME and went above and beyond what I was expecting! Keep up the great work and God Bless you all! Thank you for your community service today at Manidokan! Thanks for your successful efforts on the Taylor's Landing incident. your service to the citizens of your community. You are special in that you give your heart and soul to help your fellow citizens, and with an attitude that does not expect a thank you from anyone. Well, I thank you, and respect you inthe highest regard. Congratulations to all of you, as you so meaningfully give to all without the expectation of acknowledgement. Keep on keeping on....you are awesome!!!! Its great that you guys have finally gotten to the digital age. I just wish that you had more pictures up. I would love to see what everyone has done to 8. Since, I know when I ran (like 10-15 years ago) 8 was just a concept and land. Im also glad to see that some of the old faces that I used to run with are still around and that some new ones have come on board. Thanks for making the U.S.A. a safer place to live, May God Bless you all and your familys! Welcome to the web and FireHouseSolutions family.